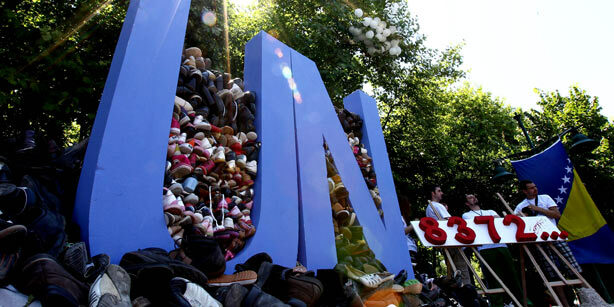 The Srebrenica genocide, known as the worst massacre in Europe since World War II, was condemned in İstanbul's Taksim Square on Saturday by 8,372 pairs of shoes in front of a monument consist of two steel-framed pillars in the form of the letters U and N (United Nations). A total of 8,372 Bosnians were killed in and around the town of Srebrenica in Bosnia and Herzegovina in July 1995 by units of the Bosnian Serb army under the command of Gen. Ratko Mladic during the Bosnian war. Young Bosnians Association President Enisa Kezo stated that this monument serves as a metaphor for the “betrayal of the United Nations,” which failed to prevent the Srebrenica genocide from happening and to intervene to stop the mass killing of thousands. “The whole world should remember this genocide and should see the United Nation's dishonor,” stated Enisa Kezo. She later criticized those who called the genocide a “massacre,” saying, “This cannot be a massacre because a massacre is nothing compared to genocide.” Kezo thanked Prime Minister Recep Tayyip Erdoğan and Foreign Minister Ahmet Davutoğlu for their support in the project.